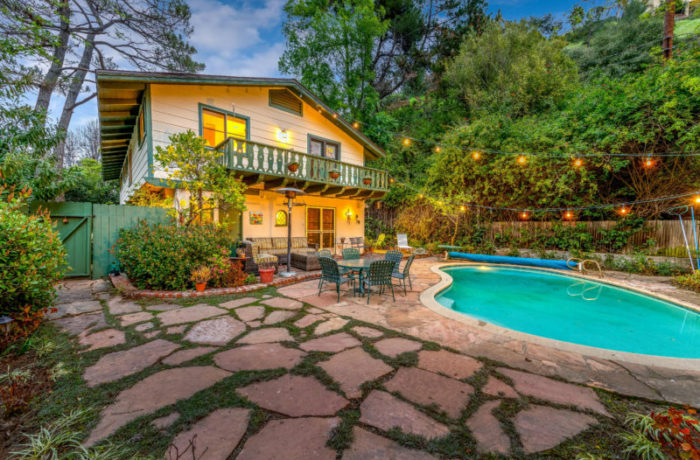 Offered for $2,400,000 | Bel Air traditional two story family owned home nestled in the hills behind the Bel Air West Gate with pool. The 3 bed, 2.5 bath plus office is the perfect retreat. Living room with exposed wood beams, wood paneling, original peg and groove wood floors, exposed brick gas/wood fireplace, full bar and room for a grand piano makes it a great room for entertaining. Formal dining room off of kitchen with eat in table. Master suite upstairs with walk-in closet, fireplace and en-suite with high countertops, double sinks, two person spa tub and oversize shower. Two additional bedrooms plus bonus room down central hallway. Newer composition roof, newer landscape architecture and sprinkler system. Central AC/Heat, attached two car garage. Located in the prestigious Roscomare Road School district. Easy access to Sunset and to Mulholland.